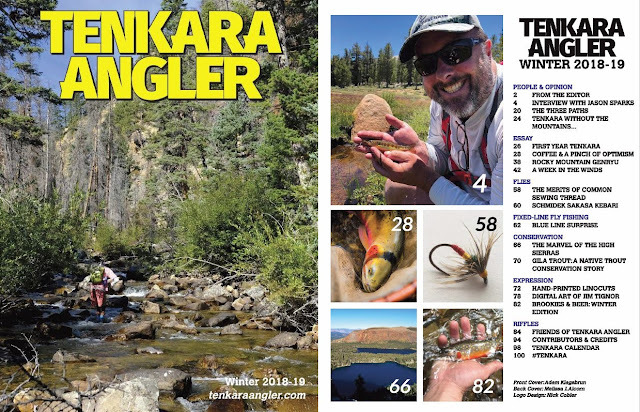 I'm happy to announce that the Winter 2018-19 issue of Tenkara Angler magazine is (finally) live! It took way too much time for me to cobble together between the holidays, work, and assorted seasonal illnesses, but it's done and I think it came out damn good. The contributions were fantastic with some really stellar opinion pieces from Jay Johnson, Dennis Vander Houwen, an interview with Jason Sparks from Adam Trahan, essays from Mike Hepner, Adam Klagsbrun, Melissa Alcorn, Paul Vertrees, and Michael Richardson, fly tying info from Robb Chunco and Mark White, conservation pieces from Brad Trumbo and Craig Springer, art from Anthony Naples and Jim Tignor, photo entries from Paul Pigeon, Jason Hammond, and Shigeki Miura, and "Brookies & Beer" from John-Paul Povilaitis! 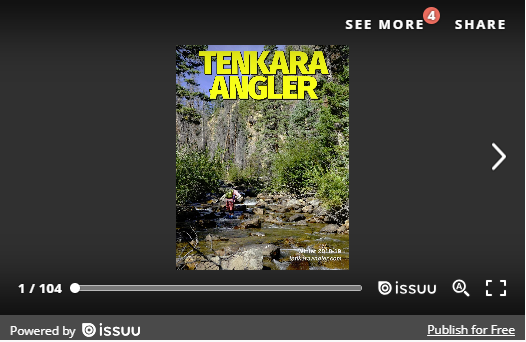 That's a lot of free content, and I think you'll really like what you find inside.